Jakarta (Antaranews Jatim) - The Meteorology, Climatology and Geophysics Agency (BMKG) classified the earthquake in Situbondo at 01.44.57 WIB as a shallow type. "Taking into account the epicenter location and hypocenter depth, the earthquake that occurred was a type of shallow earthquake that was thought to be due to fault activity in the back arc thrust zone," BMKG Head of Earthquake and Tsunami Center Rahmat Triyono told reporters in Jakarta on Thursday. He said the results of the analysis of the source mechanism showed that earthquakes in the Bali Sea region were generated by deformation or separation of rocks with the mechanism of movement of faults rising. 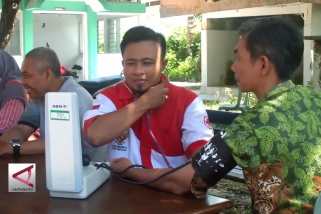 The earthquake shock, he said, was reportedly felt in the Denpasar area on the intensity scale of III-IV MMI. While the Karangkates area, Gianyar, West Lombok, Mataram, Pandaan in number III MMI. He said there had been no reports of the damage caused by the earthquake. Modeling results indicate that the earthquake did not have the potential to cause a tsunami. Until 2:30 a.m., he said that the results of BMKG monitoring had occurred aftershock with a magnitude of 3.4 on the Richter Scale. "The community is encouraged to remain calm and not affected by issues that cannot be accounted for," he said. Previously, on Thursday at 01.44.57 WIB the Bali Sea region was rocked by a tectonic earthquake. The BMKG analysis shows the initial information of the 6.4 magnitude earthquake which was updated to 6.3 SR.